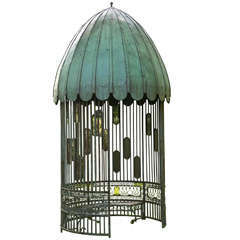 A fine wrought-iron and stone architectural gazebo or folly, of oval form, the peaked roof supported by four uprights surmounted by four hooks for hanging plants, the lower section joined by a curved balustrade with whimsical scrolls, the whole mounted on ten carved limestone blocks, French, circa 1920. Approximately 14 ft. high, 7 ft. wide, 5.5 ft. deep. English, mid-20th century. Excellent condition. Transports in four equal sections. Weight 100 kg.